Information for our winter convention will be sent out as soon as it is available. If you have any spelling corrections, etc. please contact selina cloutier. 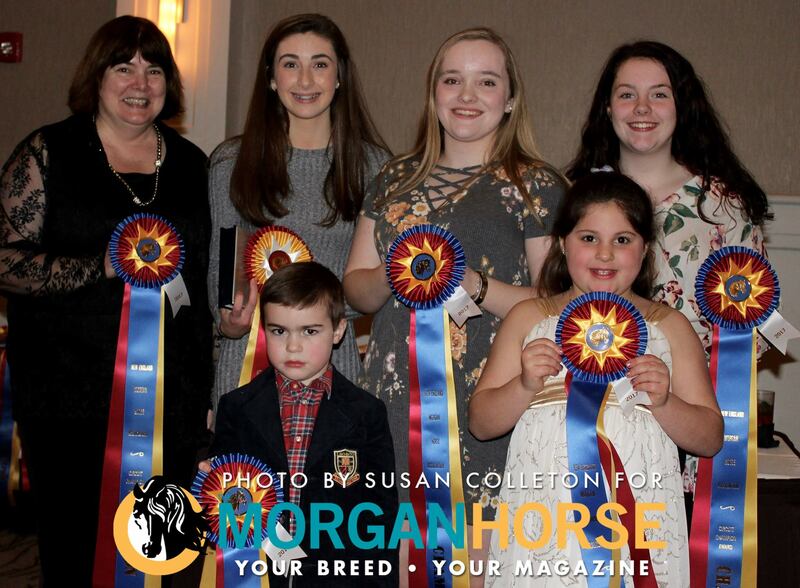 For the 2018 competition year, all the shows in the 2018 Combined Prize list will count for New England Morgan-Circuit Championship Awards. · The Owner of the horse must be a current member of the NEMHA. v If horse is owned by a farm name/entity, the entity must be registered with the NEMHA and one person from the entity must be a member. v For the Tournament Division, the rider must be a member of NEMHA. · Horse receiving the award must be a Registered Morgan Mare, Stallion or Gelding. · You must show at a minimum of two shows, and pin in two classes within the same division to qualify for a Circuit Championship. · Ribbons will be awarded Champion and Reserve for each division. The NEMHS will receive double points. The other 9 shows will be single points. A Junior Exhibitor is Exhibitor who has not reached their 18th birthday as of 12/1 of the previous year. A Youth Exhibitor is who has not reached their 21st birthday as of 12/1 of the previous year. An Amateur Exhibitor must hold an Amateur Card with USEF. A Dressage Young Rider is an exhibitor 21 years of age and under as of 12/1 of the previous year. A Dressage Adult Rider is an exhibitor over the age of 21 as of 12/1 of the previous year. All Walk/Trot Riders must be 11 years of age or younger as of 12/1 of the previous year. All Leadline Riders must be 7 years of age or younger as of 12/1 of the previous year. MAIDEN, NOVICE, and LIMIT HORSE classes will count towards the Open Division Circuit Championship. MAIDEN, NOVICE, and LIMIT Rider/Driver classes will count towards the Amateur Division circuit championship unless shown by a Junior Exhibitor, then the points will count towards the Junior Exhibitor Division circuit championship. Specific MAIDEN, NOVICE, and LIMIT classes for Junior Exhibitors will count towards the Junior Exhibitor Division Circuit championship. Amateur classes will only count towards the Amateur Division Awards. If no Amateur Circuit championship in a division is given, points will count towards the Open Division. Jr. Ex classes will only count towards the Jr. Ex. Division Awards. If no Jr. Ex. Circuit championship in a division is given, points will count towards the Open Division. If a horse is shown in a Jr./Novice Class, the points will count towards the Jr Division Circuit Championship award (if offered) if the horse is 4 years of age and under. All other points will go to the Open Division Circuit Championship Award. In classes that have two possible divisions in the name (with the exception of Jr./Novice), points will go towards the 1st/primary division. Points to be accumulated in all Morgan In Hand classes. Points to be accumulated in any Junior English pleasure Saddle class and Championship. 6. AMATEUR ENGLISH PLEASURE SADDLE. Points to be accumulated in any Junior Pleasure driving class and Championship. This division may be split to include a 2 year Old Pleasure Driving Award if entries warrant. Points to be accumulated in any Amateur Pleasure driving class and Championship. Points to be accumulated in Junior Exhibitor Pleasure driving class and Championship. Points to be accumulated in Classic Pleasure Saddle classes including Open, Maiden, Novice, Limit, Junior, Ladies, Youth and Open Championships. May be split Jr and Open if entries warrant. Points to be accumulated in Classic Pleasure Driving classes including Open, Youth, Ladies, Maiden, Novice, Limit, Junior and Open Championships. May be split Jr and Open if entries warrant. Points to be accumulated in Junior Exhibitor Classic Pleasure driving class and Championship. Points to be accumulated in any Junior Hunter pleasure class and Championship. Points to be accumulated in any Junior Western pleasure class and Championship. Points to be accumulated in any Amateur Western pleasure class and Championship. Points to be accumulated in Junior Exhibitor Western pleasure class and Championship. Points to be accumulated in any Roadster to Bike and Roadster Under Saddle class. Points to be accumulated in any Saddle Seat equitation class including open medal classes such as: NEHC, UPHA, AMHA, USEF, Good Hands etc. If shown on a Morgan Horse. Points to be accumulated in any Stock Seat or Western Seat Equitation class or Medal and championship where the rider is on a Morgan Horse. Points to be accumulated in any Saddleseat Walk/Trot Equitation or Classic Saddleseat Walk/Trot Equitation class or championship where the rider is on a Morgan Horse. 32. SADDLE SEAT WALK/TROT PLEASURE. Points to be accumulated in any Saddleseat Walk/Trot Pleasure or Classic Pleasure Saddleseat Walk/Trot class or championship where the rider is on a Morgan Horse. Points for UPHA and NEHC Walk Trot Medals to also count. 33. HUNT SEAT WALK/TROT EQUITATION. Points to be accumulated in any Hunt Seat Walk/Trot Equitation class or championship where the rider is on a Morgan Horse. 34. HUNT SEAT WALK/TROT PLEASURE where the rider is on a Morgan Horse. Points to be accumulated in any Hunt Seat Walk/Trot Pleasure class or championship where the rider is on a Morgan Horse. 35. WESTERN SEAT WALK/JOG EQUITATION. 36. WESTERN SEAT WALK/JOG PLEASURE. The top five scores at intro level must be earned at a minimum of 2 different shows and from 2 different judges. A copy of score sheets must be submitted to Point secretaryOR a copy of the USDF score check with the scores to be used highlighted for scores to be awarded. The median (middle) score of the top 5 tests will be the year-end score. The top five scores at intro level must be earned at a minimum of 2 different shows and from 2 different judges. A copy of score sheets must be submitted to Point secretary OR a copy of the USDF score check with the scores to be used highlighted for scores to be awarded. The median (middle) score of the top 5 tests will be the year-end score. The top five scores at Training level must be earned at a minimum of 2 different shows and from 2 different judges. A copy of score sheets must be submitted to Point secretary OR a copy of the USDF score check with the scores to be used highlighted for scores to be awarded. The median (middle) score of the top 5 tests will be the year-end score. The top five scores at Training level must be earned at a minimum of 2 different shows and from 2 different judges. A copy of score sheets must be submitted to Point secretary for scores OR a copy of the USDF score check with the scores to be used highlighted to be awarded. The median (middle) score of the top 5 tests will be the year-end score. The top five scores must be earned at a minimum of 2 different shows and from 2 different judges. A copy of score sheets must be submitted to Point secretary OR a copy of the USDF score check with the scores to be used highlighted for scores to be awarded. The median (middle) score of the top 5 tests will be the year-end score. The top five scores must be earned at a minimum of 2 different shows and from 2 different judges. A copy of score sheets must be submitted to Point secretaryOR a copy of the USDF score check with the scores to be used highlighted for scores to be awarded. The median (middle) score of the top 5 tests will be the year-end score. The top three scores at 3rd level or above must be earned at a minimum of 2 different shows and from 2 different judges. A copy of score sheets must be submitted to Point secretaryOR a copy of the USDF score check with the scores to be used highlighted for scores to be awarded. The median (middle) score of top three scores will be the year-end score. Since many of the circuit shows do not include the higher dressage level divisions, third level and above can submit to the point secretary scores from one outside show to qualify (ie. NEDA Spring Show, etc.). This award may be split by level if entries warrant. Points to be accumulated in any Western Dressage classes.A minimum of five scores must be earned at a minimum of 2 different shows and from 2 different judges. A copy of score sheets must be submitted to Point secretary for scores to be awarded. The median (middle) score of the top 5 tests will be the year-end score. This award may be split by level if entries warrant. To be awarded to a Morgan mare, stallion or gelding. May be split if entries warrant. Points to be accumulated in Carriage Obstacles, Carriage Dressage, and Carriage Pleasure. Points to be accumulated in any Carriage obstacles type class. Points to be accumulated in any Carriage Dressage class. Points to be accumulated on any judged ride. Participants must submit by November 15th of each year a copy of either the judge’s or Veterinarian’s official score sheet clearly indicating the horse’s score and placing to the NEMHA’s point secretary. Points will count only toward competitive trail rides. Points to be accumulated based on the number of miles ridden. Mileage must be submitted to the tabulator. Any “Organized” Trail Ride Event may count. Miles will only count toward the mileage trail award. Points to be accumulated in any Tournament/Academy Leadline pleasure, showmanship or equitation class. 54. TOURNAMENT WALK TROT 12 & UNDER Points to be accumulated in any Tournament/Academy Walk Trot 12 & under pleasure, showmanship or equitation class. Tournament/Academy Walk Trot 12-17 (or 12 & over-if not split) pleasure, showmanship or equitation class. Tournament/Academy Walk Trot Adult (or 12 & over-if not split) pleasure, showmanship or equitation class. Tournament/Academy Walk Trot Canter 17 & Under (or all ages-if not split) pleasure, showmanship or equitation class. Tournament/Academy Walk Trot Canter Adult (or all ages-if not split) pleasure, showmanship or equitation class.